Her husband is angry again. He paces back and forth in the bedroom, looking for his belt, his hand running through his hair. His face wears anxiety. Worry furrows his brow. “Can I help you with anything?” she asks. “I can’t tell you anything because you will think I’m telling you that you’re a bad wife, so I can’t ask you for help finding my belt – and then you’ll just get mad at me because I didn’t put it away and I never pick up my clothes and it will be all about how I need to change and be better,” he says. His words fly out of his mouth with disdain and contempt, dripping accusation onto her heart. She wonders silently to herself, a little confused, but familiar with the misperception toward her. She used to get upset at these outbursts aimed at her or whoever else might be handy, but she has been spending regular time with God for a long time, so her sight is clearer in this moment, and she can see what is true. And what he says is not true. She has owned these things in the past, but that was nearly 20 years ago when his losing something would make her think he was irresponsible, or his comment would result in her feeling like she should be picking his clothes up off the floor for him. She realized years ago, however, that those attitudes were the sin of judgment – toward him and herself. They were sin. She’s been different for a long time, nearly two decades, actually, but he can’t see it. She thinks maybe the accusations come from old tapes, but none originate from things she’s actually saying (or even thought) or how she actually felt in many years. She also usually does not feel inadequate at all, thankfully. She knows the Father’s Truth for her: she’s a sinner saved by grace, not perfect, but she also does her best, tries to improve, and makes mistakes and apologizes for them. She wishes her husband did not come up with these negative ideas about her, and sometimes, when she fields more than several from him in a day toward her and their kids, she is worn from the onslaught of accusation…but in this one moment, she knows she can’t control his thoughts. Unfortunately, his words toward her nearly daily are negative. Prescriptive. Accusing. His communication toward her in small ways repeatedly communicates he thinks she is insincere, uncaring, unloving, and even hateful toward him. He doubts her love and affection for him – and as a result, rejects her efforts toward him. But daily, she still keeps trying, obeying God in how she treats him. At her core, she knows he doesn’t feel worthy of positive anything from anyone, not just her. She has watched him reject affection and kindness from others, attributing their behavior to heinous motives instead of receiving gifts of God’s love through His people. She feels sad for him. How alone must he feel? Her prayer for years has been that he deeply receive God’s love, fall in love with Christ and see himself the way the Father sees Him. So far, God seems to not be answering, or maybe she can’t see through her own hurt, too. She is not sure. As her thoughts dwell on past failures with him, she begins to long for something different for them both for a moment. His words combined with the twist in her own thoughts begin the sting. Tears well. She begins to feel the accusation threatening to crush her heart. “What’s true, Father?” her soul cries out. Love is true. Love is patient. Love is kind. Love speaks the truth, gently, with intent to restore. So what is true? She knows he loves her, even though it doesn’t feel like it right now. She knows she loves him, too, so in this moment, she will choose to act on that, instead of taking his words personally and being hurt by them. And she doesn’t sense the leading to confront his sin against her in this moment. She remembers. The accuser wants to blame, to criticize, to judge. The accuser wants her to be useful to him. She knows that like her husband, she has also been useful to the accuser, the enemy. She could join him now in blaming her husband and justifying her hurt – but that is also not being loving. She refuses to receive accusation – toward herself or her husband. 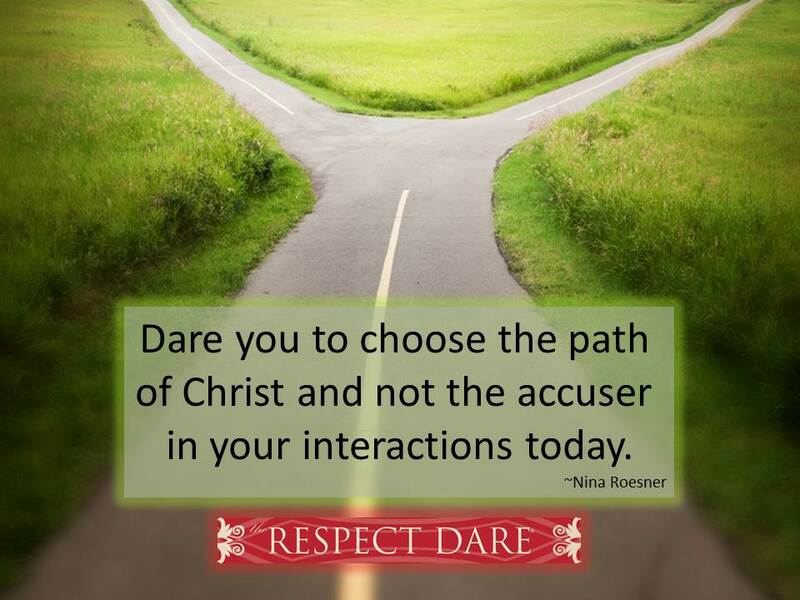 She refuses the invitation to join the accuser in discouragement, despair, anger, hurt, and resentment. She refuses the invitation to battle with her husband. She accepts that she is precious, even though someone is not treating her as such right now. She accepts God’s invitation to join Him in a place of peace. And her heart calms. She then invites her husband to join her in that same peace. “I’m so sorry you are having trouble finding your belt – but know I’m just wanting to help. I’m not upset at all about you not knowing where it is… Please know I don’t feel responsible for your stuff, and yeah, I do put it away sometimes, but I’m not judging you or myself about your belt. Which one is it? Can I help you find it?” she inquires. “It’s not your problem,” he says, sighing, and wanders off. She owns none of this and goes about her next task, wondering if her husband received her love, knowing he at least received the invitation to join her in peace. True, he refused her help, but he also refused to continue to be useful to the enemy and continue the battle toward her. He who seeks good finds good will, but evil comes to him who searches for it. In the midst of the many moments of a day, we are repeatedly presented with THE CHOICE. In just a few seconds, we either choose to walk the path of the enemy, or the path of Christ. If we are “prayed up” and “read up” (meaning we’ve had regular devotional time with God – reading the Bible, listening to Him, and sharing with Him our struggles and requests) we have a greater opportunity to see things through what we call the Lens of the Holy Spirit – seeing the way God sees. We are not as easily deceived. It’s Philippians 4:8 in action: whatever is true, noble, pure, lovely, admirable, praiseworthy, and excellent – think about these things. That verse is the theme of our ministry, Greater Impact. It is also my “life verse” and has been instrumental in changing all of my relationships in positive ways, including my relationships with God, myself, and others, especially my husband. When I look at Dare 26 from The Respect Dare, I can see another verse coming to life in both the book, and the story above. I also see the reviewers who criticize The Respect Dare on Amazon or on their blogs differently than I may have in the past. I just feel sad for them as they pen their own accusations. They don’t get it. They see respecting our husbands as being a doormat, when in fact, it is not. I wonder if they believe that demanding better treatment from anyone actually works? Has it for you? I know it has not for me, or others. Marriage provides a strengthening context where we learn to not be selfish, pull together, and are not alone – if we’ll but do it God’s way. But when our heart is at war with God, no truth can penetrate. They misunderstand me and misperceive the words He had me write – I’m not endorsing second-class citizenship for women, but rather freedom from our own sins of judgment, which shows up as self-justification and blame. Love instead of hateful behaviors that destroy relationship. Speaking the truth in love, not lying to “keep the peace” – and in the lie, the peace is not actually kept, but rather the deceiver wins another round, causing anger within us as we betray ourselves, our God, and others. The story in the book talks also about the Biblical concept of “submission.” There’s more going on here, however, than initially meets the eye. The more I come to know God, the more I understand that as we grow as followers of Christ, we naturally become more open to receiving Truth from other followers of Him. I also fully embrace the Truth that women are not second-class citizens, but that we are told specifically to submit to our husbands because we are going to be less inclined to naturally do so. And submission isn’t what we think it is. I used to think the verse above in Corinthians meant I was to be a doormat and just go along with whatever anyone else said, laying down my own opinion. I used to think the concept of submission meant the same thing – except applied to my husband. And lest you think I’m spewing heresy, understand I’m not the only one to claim this is true. Dr. Larry Crabb and others also speak to these in a number of writings. What if “agree with one another so that there may be no divisions among you” and being “united in mind and thought” meant that we wanted God’s best in the middle of a situation? What if you could agree in such a way that you could still communicate that you had a different opinion without causing division? THAT’S what I’m talking about here. Do you see the difference? OPEN to understanding that we are not perfect ourselves, and therefore OPEN to God’s Best, which might mean that we might be wrong, or that the “solution” was a combination of our husband’s thought and ours – not specifically either person’s alone! OPEN to whatever the solution might be because we are OPEN to God, and OPEN to other people? Being “open” to other people means that we can disagree without creating division. Does this make sense to you? Do you see the difference from being a doormat and being agreeable while disagreeing? It’s disagreeing in an agreeable way, if you will. It’s being agreeable, even as we in an gentle but “open to the person as precious to God” disagree. It’s caring more about the person than we do about being right, even if it ends up that God’s best sides with our opinion. Know the Father – daily time with His Word, the Bible, then listening and praying. It’s the most important 15-60 minutes you can spend in a day, even if it is broken out into 5 minute increments. It’s an investment that pays off more than you will know this side of heaven. It will teach you how He loves you – which deeply changes 100% of your relationships, especially your relationship with yourself, which spills over into all others. Obey His Word – even when you don’t fully understand it. I’ve struggled through submission, respect, grace, forgiveness, apology, love, etc., and still do – but trying to obey creates a vertical growth curve in which you can truly know Him – and you’ll start hearing His voice and seeing Him everywhere. Be Thankful – there’s no room in a heart of entitlement for peace. Failure to be deeply moved and grateful indicates a heart battling against others and God, a disagreeable heart, a heart with idols. Refuse to receive accusation or dish justification of your own behavior or blame towards others. Those are calling cards of the enemy. ANY TIME we are engaging in those behaviors, we are useful to him. Speak Truth in a gentle, open, agreeable way – like our girl above did. Daily create positive small communications in your marriage – take inventory and take action. Recent research by Shaunti Feldhahn indicates that the happiest couples believe the best about each other, instead of doubting sincerity, or hurling accusations about one another’s motives. Her research also indicates that it is the “little things” that matter most. We have a list of those for men and one for women to help you. The daily dishing of negatives usually involve contempt, which is present in most couples miserable enough to file for divorce, according to research by Dr. John Gottman. Bottom line? Assume the best, toss the rest, and daily dish small positives. Love to you! Can’t wait to hear your thoughts on this today! 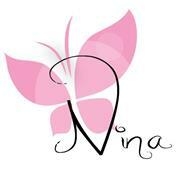 Nina, you wrote this for ME – this story is my husband and this story is me. Many of your posts have spoken to me but this one is scarily accurate, as if you were in my home, quoting from our conversations. Thank you for so lovingly pointing out the right way to respond to a man like this. Thank you for showing me where I was going wrong. Although in the last few months as I’ve worked my way through the Respect Dare, I’ve changed somewhat in my verbal responses to him, I know that in my heart I still have this feeling of entitlement and righteousness that flares up when he becomes angry and accusatory towards me. Sometimes I voice that out loud, and sometimes I keep it hidden behind a wall of self-imposed “calm” and “peace”. But I know that the self-imposed “try-harder” mentality doesn’t truly work in the long run and I need more of Jesus to truly become that person – an honestly, truly gracious, loving, respectful-even-when-he-doesn’t-deserve-it wife. That’s the woman I want to be, and with God’s help I will be. Thank you for showing me that and for all the work that you do to support women like me. I think I need more of Him, always. 🙂 It’s the only place being invisible feels good! 🙂 LOL! Any good you’ve seen in the book or here is from Him – and I’m glad to not be in His way. I do love you and want to support you as you journey like I am in obedience and worship out of love and gratitude – I get that whole “entitlement” thing – wish I didn’t! LOL! Honestly, the more I know Him, the more I realize how much I deserve the fires of hell, and what a big sinner I truly am. Thank GOD He doesn’t give us what we deserve when we actively choose Christ!! Nina, I forwarded this timely post to my son, as I saw this was good for any relationship not just marriage. He said he loved, loved, loved! ( his words) how you wrote it and it was extremely helpful in his situation. Thank you !! I am so very thankful I learned this lesson of unconditional respect. Just last week I was able to put it into practice when my grown child and her father had a disagreement. I supported him 100% and the she didn’t understand why when she felt he was wrong I should back her.. I tried to explain it to her, I hope she gets it! I know though that my 13 year old daughter gets it! She even approached me to tell me she did and that she knows that just because I do not question or contradict him in front of her, it doesn’t mean that I completely agree and that I won’t find a proper time and respectful way to communicate to him. I felt such a serge of gratitute for the Lord that He was able to teach me this and that through my conversations and modeling this my youngest daughter understands. She was the most difficult the past year and that was HUGE for me. Just what I needed to read today. Struggling in this area a lot and learning to trust my husband all over again isn’t easy but I know God is telling me to trust in him. Doing it on my own only makes things worse. OH ME TOO. 🙂 I get this. I hear it. I feel it, too. This could be a story out of my own marriage so many times! As you I tell a difference in my reaction to such times (which thankfully are fewer) when I’m on the Word and actively praying and when I’m not. Being able to see my husband through God’s eyes and see that so often when he gets like that it’s not me he’s attacking but that he feels safe to vent at me because of the stress and hurt from the outside world. He knows my love is forever and I’ll forgive so he can be frustrated with me when he can’t be elsewhere. Not that it’s right he does (but he’s getting better), but my reaction to him in those stages is vital! I know, right? He is transforming our hearts. SUCH a blessing to you both that you know of each other’s love. Thank you for allowing God to use you as well. Very timely! I am overwhelmed at how the Lord uses different ways to speak to precisely the issue that I am struggling with. My prayer time this morning was regarding continued verbal battering with accusations as you described in your blog this morning. It was written for me, and spoke almost word for word to my situation. Thank you for allowing yourself to be used of God, you are touching lives and truly being his instrument for healing.